More from the superhero world after Avengers and their Two-wheeled Marvels. This time, we talk about DC Comics superheroes. ‘The Justice League’ characters are always compared to the Avengers following the DC-Marvel rivalry. 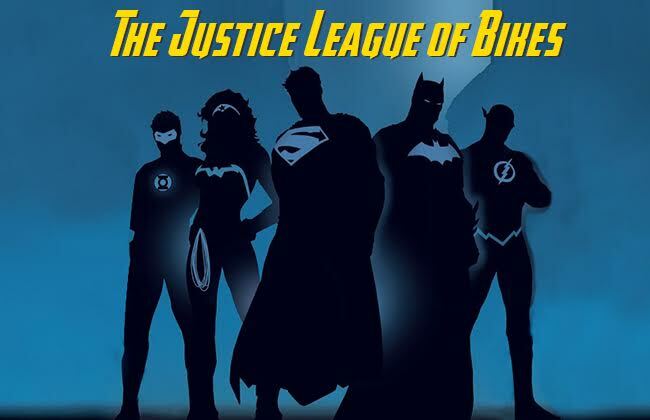 Comprising team members like Superman, Batman, Wonder Woman, Green Lantern and Flash, the Justice League takes the action and energy of the superhero universe to another level. Batman and Superman, being the most popular of the lot, recently featured in a much-awaited movie, Batman vs Superman: Dawn of Justice. These reel world superheroes can represent some motorcycles in the real world. Let's find out what the superheroes get! The ‘Man of Steel’ is among the most powerful fictional superheroes created till date. No matter what the situation is, Superman is quick to act and save the day. He belongs to a different planet called Krypton and is alien to our world. Like Superman, the Ducati Desmosedici RR is the street legal version of the MotoGP bike from Ducati. It was a limited production and one of the costliest bikes of Italian bike maker's line-up, having a power output of around 200bhp and a top speed of over 300kmph. The ‘Dark Knight’ is the only superhero that does not possess any special powers. Instead, he is a genius intellect and depends on his abilities and gadgets. He has already been seen driving the Batpod, which ejects from the Tumbler Batmobile in The Dark Knight movie. If Batman is to be a motorcycle, he will be the Vyrus 987. Like the powerful Batman, the 987 is immensely powerful, in fact, it is one of the most powerful production motorcycles in the world. It churns out 167 horses and features jet fighter-inspired lights which make it a contender for Batman over the Batpod. A million dollar bike for a million dollar woman. If Wonder Woman would be a motorcycle, she would be the Harley-Davidson Cosmic Starship, painted by Jack Armstrong. Having a wide range of superhuman abilities, the superwoman definitely stands out from the crowd, just like the custom painted Harley Cosmic Starship that looks unique. The bike has been given the title of the ‘Only Million Dollar Harley’. A power to create things with his ring, the Kawasaki Ninja H2 and the Green Lantern are the ones which show great will power. The green Ninja H2 is the only production motorcycle from the line-up which is presently being sold in India. Green Lantern gets a variety of powers from the ring and powering the Ninja H2 is a 1-litre unit generating around 200bhp of power. This offering from the Ninja lineup is priced at Rs. 29 lakh (ex-showroom, Delhi). Made in the memory of famous motorcycle World Champion, Barry Sheene, the bike is fully handmade. This power packed motorcycle resembles the DC Comics superhero, Flash, whose real name is Barry Allen. Termed as a new breed of bikes by the founder of Icon Motorcycles, it is different from all others like the Flash, who is faster than the fastest on the planet. The detailing of this handmade product is done superbly and there will be only 52 of these bikes. Do let us know your views on the topic. Also, according to you, tell us which motorcycle should these superheroes be in the comments section below.